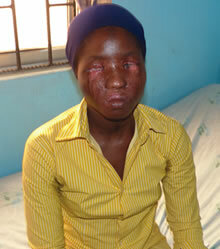 This lady was blinded through an acid attack by a disappointed suitor. The lady, Lateefah Adesope, is said to have spurned the advances of one Alabi Olokode, which led to him pouring acid on her face in revenge. The Lagos State Police Command has now confirmed that it will charge Olokode with attempted murder for allegedly assaulting Adesope, PUNCH Metro reports. Olokode is being detained at the Homicide Unit of the State Criminal Investigation Department, Yaba but still denies the allegations. A source said, “Olokode has written statements but has maintained his innocence despite contrary evidence. “I was on my way to say my morning prayers at Tekunudeen Mosque, Aboru on Friday, December 30, 2011,” she said. “He was hiding near the mosque and suddenly called my name. As I turned back, he poured a liquid substance on my face. The liquid went straight into my eyes and started burning my face. At that time, I didn’t know it was acid but I just realised that I couldn’t open my eyes because of the burning sensation I was having. When I started screaming, people around me confirmed it was acid because the substance consumed part of my veil”. Lateefah was then taken to the Lagos State University Teaching Hospital (LASUTH), Ikeja, a few weeks after which, she was told she would never regain her sight. Her mother said she had taken Lateefah to a different hospital for a second opinion but they reiterated that all hope had been lost. “I took my daughter to Antilla Catholic Hospital Eye Centre, Agege” she said. “The doctors told us that if she had been brought earlier, Lateefah would not have lost her sight”. However, the LASUTH management denied complicating Lateefah’s case and insisted that she was properly attended to. The Public Relations Officer, LASUTH, Mr. Dele Johnson, said the hospital remained one of the best in the country. The Police Public Relations Officer, Mr Joseph Jaiyeoba, said the investigation is ongoing. This cruelty of the highest order! Such a man should not be left off without punishment.